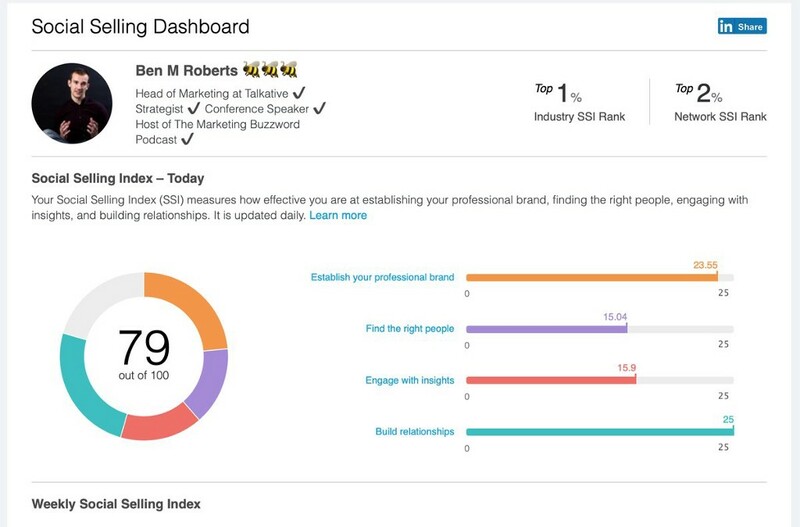 Ben M. Roberts tracks his social selling index on LinkedIn. Social selling can be a touchy subject. For starters, the online platforms are called social media, not sales media. Many aspiring entrepreneurs have jumped online intent on doing business first before creating and honing relationships. Ben M. Roberts sympathizes with business owners new to the social jungle and has mapped the path to success. He heads marketing at Talkative, a firm that helps companies communicate with customers through their website or app. Roberts also hosts The Marketing Buzzword Podcast and is a digital marketing strategist and speaker. He believes in online reviews and customer service, which blended well in a discussion about social selling with social media consultant Madalyn Sklar. “Social selling is the art and science of being able to sell your goods and services to people on social media without actually selling them,” Roberts said. There are similarities between selling on social media and social selling. “They both result in sales,” Roberts said. “If a business or person isn’t wanting to make a sale at some point, then it is neither social selling or selling on social media. It’s networking. The distinctions between the two approaches are subtle. “They are both disruptive in different ways,” Roberts said. “Both aim to grab people’s attention and make you want to read more, find out more or buy more. One is just more relationship and conversation based. A key difference is the type of relations. “Social Selling looks to build more of a longer-term relationship, which involves multiple touch points over time,” Roberts said. “Selling on social media looks at shorter-term tactics to grab attention and quickly turn views into leads. Social selling is about relationship building. Anticipating business transactions can be futile. Predicting sales is like predicting going viral. If you could do that, everyone would do it. The best results come from perseverance, hoping for the when timing and circumstances fit for seller and buyer alike. At best, forecasting sales is tough. “It’s less measurable in the sense that — if you are cold outreaching — you can build a rough idea of say 40 outreaches may equal one lead,” Roberts said. “That’s tangible. It can be much harder to directly gauge the impact of a single conversation. Great content greatly connects with your audience. That means you’ve done the footwork for engagement and social listening to learn your audience’s issues and pain points. Then you can create content that generally meets their needs. Helpful. It has to be helpful. It has to offer value, be it unique insights, hints, tips or tricks. Always think ‘What Is It Going To Do For Them?’ — or WIIGTDFT for short. Giving. Offer advice, help and guidance within the social media platforms. Don’t send potential customers away. It’s a mistake I’ve made before. The more value you can offer in the moment, the better. Personality. Remember that people buy from people. Your personality is one of your greatest assets. Make your content, fun, engaging and personable. That’ll keep people interested. Marketers use relationship building to convert their online community into paying customers. Buying is based on emotion. You can’t have genuine emotion unless you’ve created a relationship. Relationships are the essential first step without which there is little chance to close sales. Personalization. People will always pay for a tailored and personalized package. It will help them know exactly what’s relevant for them. They also want your time. You are the valuable asset. That’s what they are paying for. Resource. Become a wiki for your industry. By becoming the hub for all relevant content on your industry, you will stand out over and above your competitors and be seen as the experts. Knowledge sells. Value. Focus on value and consistency over time. That equals authority and trust. Authority and trust plus need equals a sale. Social selling emphasizes “social.” You can be social online and off. In fact, offline is where you close sales. With a social mindset, you’re prepared to follow through with potential customers whether your initial connection came in a chat or over the counter. “You can — and should — take conversations into other more intimate or offline environments,” Roberts said. “Conferences and events are amazing for this. Above all, keep your objective in mind. “The goal is selling, but not every conversation should and has to equal a sale,” Roberts said. “Like out-of-business relationships, some work, others don’t. Sometimes you’ll seal the deal, others you won’t. Roberts and Sklar continued their social selling discussion on Facebook live. Don’t fear the sale was originally published in Marketing And Growth Hacking on Medium, where people are continuing the conversation by highlighting and responding to this story.